I learn from our clients. It’s nice to think they learn from us as well, but it’s really cool when someone walks into the store with a coin, or information about a coin, that is a total stumper! Recently a visitor to our store asked about “Woodrow Wilson Dollars dated 1920.” My first thought was the Woodrow Wilson edition of the Presidential Dollar series recently completed by the US Mint. 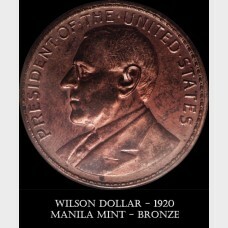 But these coins bear the date of Wilson’s two terms in office: 1913 – 1921. They were struck in 2013, either P for Philadelphia, or D for Denver. Time for some research. 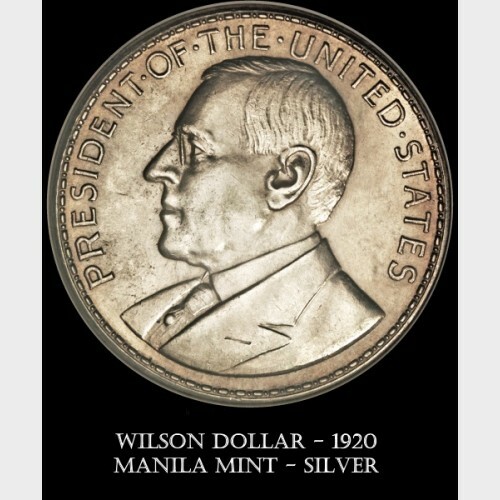 It turns out that the Woodrow Wilson Dollar coins of 1920 were indeed a US Mint product, struck in a branch US Mint that I’d never heard of: The Manila Mint in what was then the Philippine Territories. This was the only branch mint located outside of the United States. 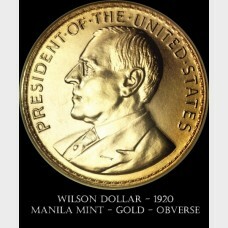 The Wilson coins commemorated the opening of the mint under US auspices, which served local coinage needs from 1920 to 1941. 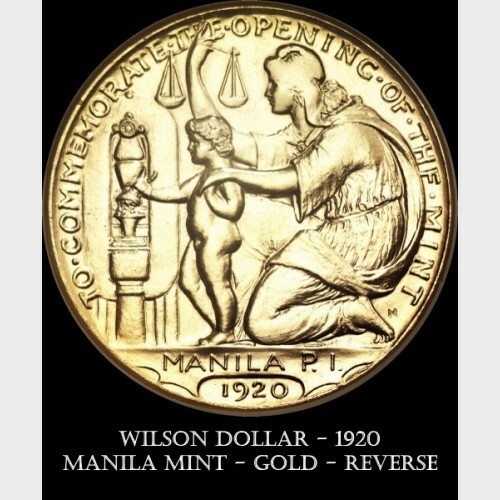 In that year of looming war in the Pacific, remaining stocks of the silver and bronze coins were moved to the island of Corregidor in Manila Bay. As it became clear that the Philippines, and especially Corregidor, would fall to the Japanese, many of the coins were hastily dumped into the bay. You may encounter sea-salvaged examples of these coins from time to time in the coin markets. 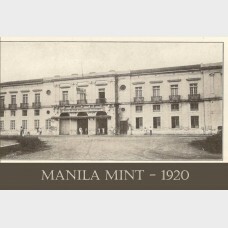 During the Japanese Occupation, the Manila Mint was briefly operated by the occupying forces. 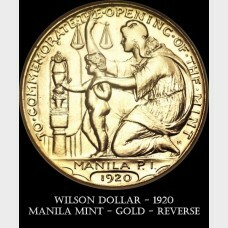 After the war, The Philippines became an independent nation with its own coinage. 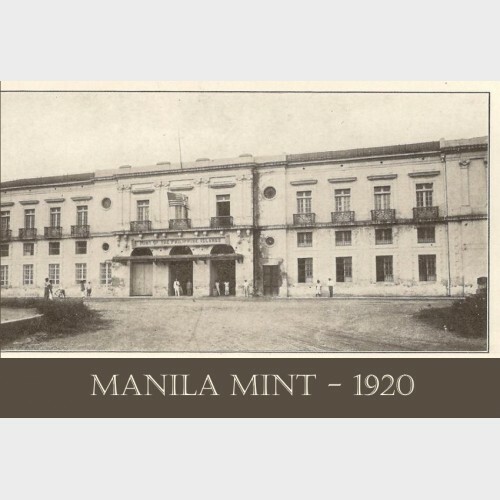 Accordingly, the new Philippine government took control of the Manila Mint which was thereby deleted from the roster of US branch mints. The Woodrow Wilson dollars were struck in gold, silver, and bronze. They were engraved by non-other than George T. Morgan the designer of the iconic Morgan Dollar of 1878-1921. The gold pieces were few in number, as few as three, no more than five, struck. Considerably more of the silver and bronze coins were produced. Collectors tend to include these in the “so-called dollars” category, which includes medals and medallions produced for significant national events or accomplishments. In this instance, the Wilson Dollar was intended as a non-circulating Philippine coin – a commemorative coin only. The common Philippine unit of exchange was, after all, the peso.